Are You Fretting over the Economy? The belief that the economy drives the stock market is common knowledge; it's Investing 101; the idea gets pounded into investors' heads, over and over again, by various pundits, daily. But please allow us to suggest this: Belief that the GDP and other economic measures drive stock market trends is completely and utterly false. The strength or weakness of the economy does not lead the stock market higher or lower. The economy follows the stock market. "Stocks lead the economy, normally by months," writes EWI president Robert Prechter; he has studied this subject in-depth. Here's an excerpt from our Club EWI resource, the free 50-page 2011 Independent Investor eBook, which quotes one of Prechter's research papers. Suppose that you had perfect foreknowledge that over the next 3¾ years GDP would be positive every single quarter and that one of those quarters would surprise economists in being the strongest quarterly rise in a half-century span. Would you buy stocks? If you had acted on such knowledge in March 1976, you would have owned stocks for four years in which the DJIA fell 22%. If at the end of Q1 1980 you figured out that the quarter would be negative and would be followed by yet another negative quarter, you would have sold out at the bottom. Suppose you were to possess perfect knowledge that next quarter's GDP will be the strongest rising quarter for a span of 15 years, guaranteed. Would you buy stocks? Had you anticipated precisely this event for 4Q 1987, you would have owned stocks for the biggest stock market crash since 1929. GDP was positive every quarter for 20 straight quarters before the crash and for 10 quarters thereafter. But the market crashed anyway. 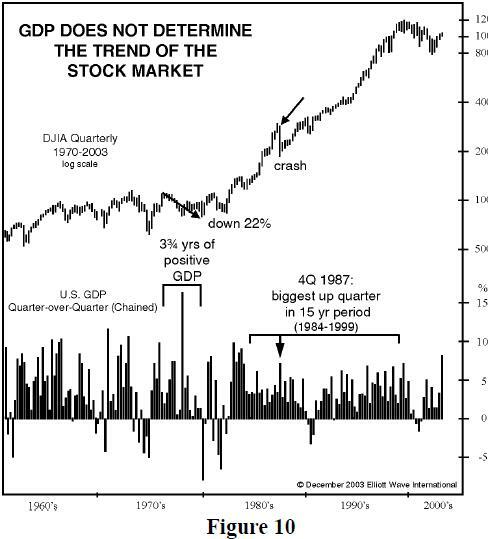 Three years after the start of 4Q 1987, stock prices were still below their level of that time despite 30 uninterrupted quarters of rising GDP. Figure 10 shows these two events. If you found this insight eye-opening, keep reading the2011 Independent Investor eBook, an educational, powerful and FREE 50-page eBook to help you think independently. Thousands of investors have downloaded the Independent Investor eBook, and it has changed the way they think forever. Now YOU can get this important eBook packed with insightful analysis from 2010 and 2011 Elliott Wave Theorist and Elliott Wave Financial Forecast. -- all you need is a free Club EWI password. This article was syndicated by Elliott Wave International and was originally published under the headline Should Stock Investors "Fret Over Economy"? No -- See Chart to Understand Why. EWI is the world's largest market forecasting firm. Its staff of full-time analysts led by Chartered Market Technician Robert Prechter provides 24-hour-a-day market analysis to institutional and private investors around the world. This brief message is all about you. To start with, however, I have to say something "about me." I've been with Elliott Wave International since 1992: That's a good long time, long enough to have seen lots of days when our staff did all it could to deliver forecasts that prepared subscribers for what's next. Yet today stands above virtually all those others. I can scarcely recall a day when we've been able to offer 1) So much, 2) So immediately, that is 3) So urgent. Here is where it's all about you. Earlier this year, The Elliott Wave Financial Forecast (EWFF) specifically forecast the juncture we've arrived at now -- it said most people believe the markets and economy are recovered and growing. But there were TWO parts to that forecast; the time has come for the second part to unfold. You're a few keystrokes away from what EWFF is saying now for free (new issue posts Friday, Aug. 5). What's more, you're a few keystrokes from reading Robert Prechter's current commentary in The Elliott Wave Theorist, again, for free. He provides you with a context to understand the events of the past week and month, which you simply cannot find elsewhere (you won't need to wonder why the blue chips are now down on the year for 2011 -- you'll know why). Finally there's the forecast in The Short Term Update: Earlier this week we alerted subscribers to action in the S&P 500 and Dow Industrials which broke below critical price levels. Perhaps you've heard some of the chatter on news and financial websites in the past 48 hours about a "head and shoulders" pattern. Yet Short Term Update subscribers got THAT news two weeks ago, back on July 20 -- along with a specific price level that would confirm the forecast. This is a wealth of forecasting; you can have it immediately; and the moment is indeed urgent. I've never seen a day quite like it. My colleagues here at EWI have put together a 2-week free trial to all three of the services I mention above. Together they give you the most comprehensive coverage of the US markets available anywhere. And as you may already know, we NEVER offer free trials to these services. You must act now as this offer ends Wednesday, August 10. Please see below for more details or start your free trial now.